October is Relationship Violence Awareness Month, and the Emory community is invited to take part in a series of public events that highlight the issue of interpersonal violence through awareness, education and dialogue. The events, which are free and open to the public, are intended to demonstrate support for and express solidarity with those impacted by all forms of interpersonal violence, says Wanda Swan, director of Emory’s Respect Program, a central hub for sexual and interpersonal violence prevention programs and survivor support. The program also aims to advance dialogue about what we can do as a campus to help ensure the respect and safety of all of our members and our surrounding community, Swan says. Among the planned activities, the Emory community is invited to join in a longstanding tradition, the Take Back the Night rally and march on Monday, Oct. 30. Participants will gather at 7 p.m. in Goizueta Business School's Jenkins Courtyard to hear remarks from a featured speaker and survivor testimonies prior to the march. Traditionally, Take Back the Night has focused on supporting survivors of sexual violence and challenging the culture of violence by centering the event solely on the testimony of survivors, says Swan. “We aim to change that by creating opportunities for community members to become active participants in lending their time and voices to heed the call and take their place in the movement,” she says. “Though we are still committed to creating a space of safety for all impacted by violence, it is important to shift our collective focus to also highlighting the voices that connect our communities to collectively challenge the culture of interpersonal violence," Swan continues. This year, the Respect Program and Emory’s Office of Health Promotion seek to expand the conversation of how violence happens on campus by providing space for survivors of all forms of interpersonal violence and their supporters, Swan says. Representatives from surrounding college and university communities are also invited to join the march. Emory students, staff and faculty — as well additional campus and community partners — may submit anonymous stories to be read at the event. This month’s events also include a donation drive for Wellspring Living, a local agency that supports survivors of sexual abuse and exploitation. 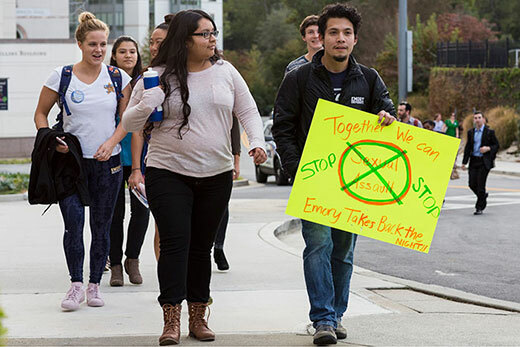 Donations of personal hygiene products, toiletries and cleaning products may be dropped off at Emory’s Office of Health Promotion, Starbucks and the Take Back the Night March and Rally. Lunch and Learn: Intimate Partner Violence Informational, co-sponsored by Emory’s Faculty Staff Assistance Program and the Emory Integrity Project, 12-1 p.m., Claudia Nance Rollins Building, Room 1055; lunch buffet for first 35 to RSVP. Wonderful Wednesday features interactive activities and poster-making sessions for Take Back the Night March and Rally, 7-9 p.m., Asbury Circle. Lunch and Learn on Trauma-Informed Care, co-sponsored by the Respect Program and Emory Integrity Project, 12-1 p.m., Claudia Nance Rollins Building, Room 1055; lunch buffet for first 35 to RSVP. Take Back the Night rally and march through campus. Remarks begin at 7 p.m., Goizueta (Jenkins) Courtyard; march to follow. Those interested in having their departments (or organizations) participate in these events should contact the Respect Program.